I first joined Stanford University's Design for America Team as a designer focused on the intersection between education, technology, and design. The following year, I served as the team's President and Project Manager, coaching five teams through the design process and giving them the knowledge, resources, and tools to go from idea to product launch/start-up. Along the way, I became involved with Design for America's marketing and branding, paying close attention to the way that DFA presents itself, shares its vision, recruits new members, and develops its professional identity both on and offline. Before immersing myself into the branding and marketing design process for our DFA team, I first took a step back to better familiarize and contextualize my understanding with the branding practices already set in place for DFA as a national organization. 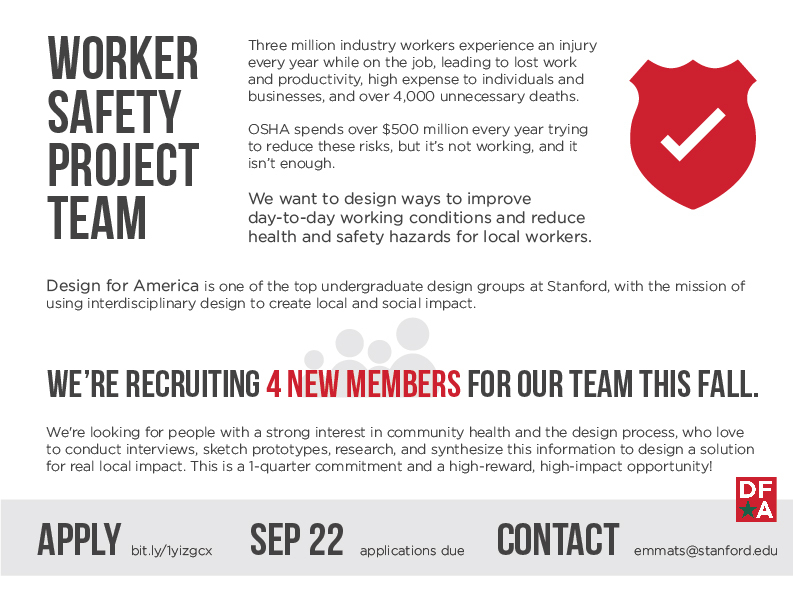 As one of many Design for America Teams at prestigious universities across the country, how did and how should DFA-Stanford stand out and brand itself uniquely on campus? From the DFA-National standpoint, DFA-Stanford best operated as a brand distinct in its red-white-green-grey color palette but similarly in its typeface and logo-stamping custom. One of our first merchandise design processes led to the production of the shirt featured below. A simple, DFA banner highlights the pocket-side of the front-chest area, while the large US map graphic on the back celebrates DFA as a national organization. White dots indicate the various locations of other universities that have established DFA teams, while an enlarged location pin demonstrates our home team.